My name Joe Galloway, I am a custom tattoo artist based in Leeds city centre . I am a full time tattoo artist with my colleague Louis Santos at our studio, Familia Tattoo. I was born and raised in Yorkshire whilst exploring various different areas of art. 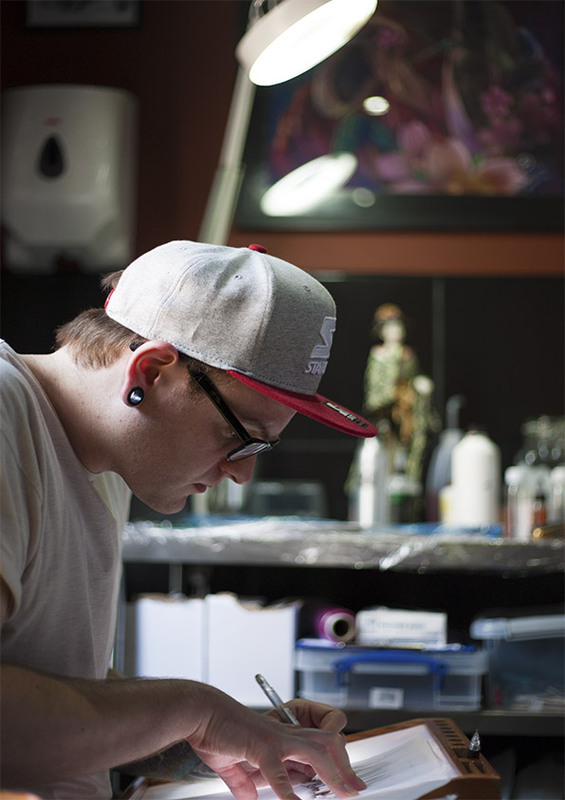 When I was young I was more creative than I was skilled with drawing, since starting my tattoo apprentice I knew that drawing was the base of everything which led me to progress as a Tattoo artist. After going to various tattoo conventions and admiring others work, it inspired me to progress as an artist and build up a portfolio. Tattooing to me is a medium that requires dedication and lifestyle changes in order to progress. From an age of 15 I really enjoyed sketching landscapes, this could be from a really dense city photo been captured just at the right time, or open landscape areas mainly been old ones such as castle ruins. By looking at this imagery combined with my own ideas I started making my own Illustration reflecting from thoughts at the time. My main preferable style of art fall into the oriental and black and grey area. I love the flow of Asian style art and for me it’s timeless, I’m still currently drawing different ways of using oriental designs with my own influence on them. I also love doing black and grey style tattoos, I love the multiple layers of detail being able to achieve as a tattoo form, its extremely rewarding from start to finish. I always love looking through art that has been done from another generation. This can be from old Japanese woodblock prints during the Edo period (1603-1867) right through to Chinese hand scrolls (ink and wash painting). I always prefer to speak to my clients before the tattoo session as this gives me more understanding of what the client is after in the tattoo, whether it’s a simple design or complex. This also allows me to have a general talk and get to the know person more.